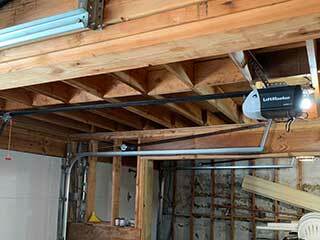 The latest garage door opener models that are available today use have a lot of technological features that their predecessors could only dream on. It is great to have a unit which automatically adjusts its operation to the settings of the door system and shuts off in case of a failure of one of the hardware components. A Chamberlain garage door opener, for example, can offer you a higher level of security as well as smartphone connectivity and rolling code technology, to mention a few benefits. However, when a problem occurs with one of the unit's components, all those added features will seem trivial, considering the fact that you may not be able to open the door at all. Not to worry, though. That's what our team is here for. No matter what the problem with the opener is, you can count on our experts to completely repair it and restore the unit to its proper operation. Our technicians stay up to date with the latest innovations and trends in our industry, in order to be able to provide effective repairs when even the most advanced screw drive units from LiftMaster (for example) break down. We have a work process which allows us to achieve the highest level of productive efficiency and time efficiency. Our specialists work with great precision and dexterity and always look for the most effective solution to the problem. We only use the finest replacement parts when fixing a problem, and we maintain a full stock of parts that can match everything from the oldest Craftsman units which are still in use to other models from brand-name manufacturers. Whether the motor gear broke and need to be replaced, the safety sensors became damaged and are no longer functioning or some part of the drive system is at fault, our technicians will be able to repair it or replace it with a new part. You can rest assured that whatever the problem may be, we'll be able to solve it. When an opener is damaged beyond repair, replacing it may be the only option. This can actually a blessing in disguise. Like we mentioned before, modern models have a lot of benefits to offer you, and they can improve a lot of aspects of your home, including safety and security. From ultra-quiet belt drive openers by Genie to powerful chain drive units by LiftMaster or Linear, there's a wide selection of options available to you. Of course, finding the right motor unit for your door can be a little disorienting, but our experts will happily consult you on this and guide you towards making an informed decision. We'll then carry out the opener installation work and make sure that the new system is fully functional and that all its features are working correctly. If you need emergency assistance with an unexpected problem, or you're interested in getting a new opener and want to consult with our team, all you need to do is give us a call. Our experts at Garage Door Repair Walnut Creek are at your service.